In the mornings I like to keep my coffee routine simple. 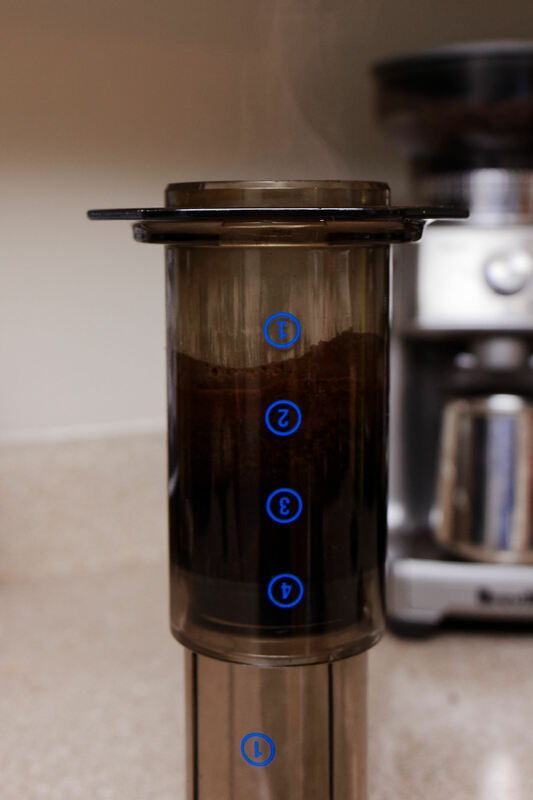 Here's a step-by-step guide on how I make my coffee using an Aeropress. I’ve had a lot of people ask me about how I make my coffee. Being a massive coffee nerd (I have more than 4 textbook style books on coffee and its chemistry) people seem to think that making my morning coffee could be equated to launching the Space Shuttle. I can assure that it is not. Here is a super simple step-by-step inspired by Marco Arment from this podcast. This is how I make my coffee using an Aeropress every morning. Coffee is 98% water. Use good water. Boil it and let it cool for a few seconds (maybe 40…it depends on how much water…use a thermometer if you want to get technical). The key is to not burn your coffee. Grind is so important. If you don’t have a good grinder have them grind your coffee at your local coffee shop. 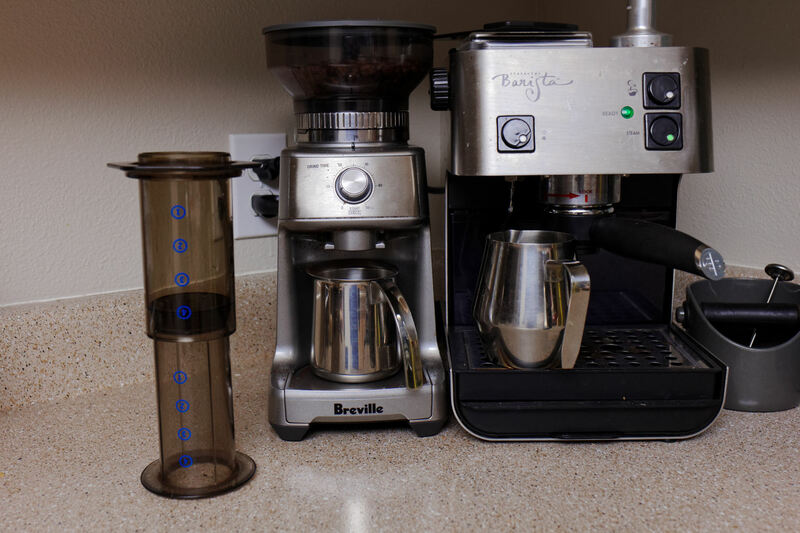 I’ll nerd out in another post about my Breville Grinder but of the grinders that I have tried the Dose Control Pro is the best bang for your buck that I’ve found. 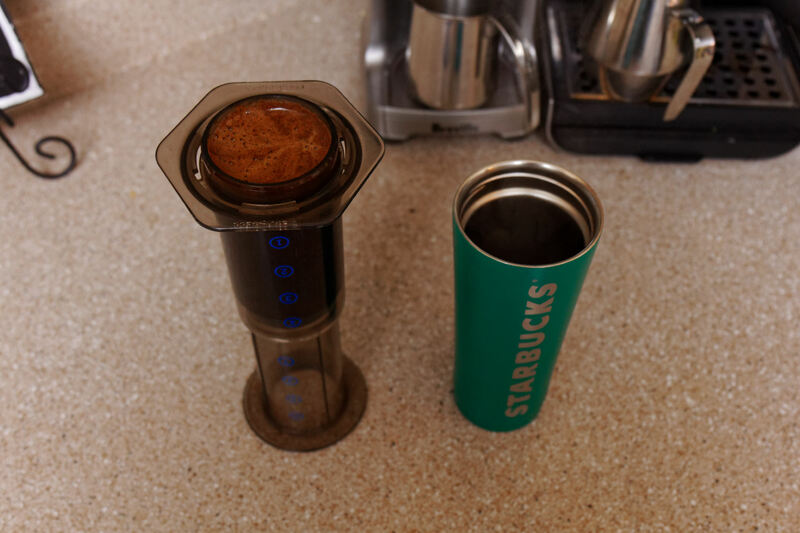 For the Aeropress, I’ve found that sand-like is fitting. On my grinder this is around “15” but your mileage may vary. I think Coffee should be weighed. Not dosed by timed or done with a scoop. Weighed. 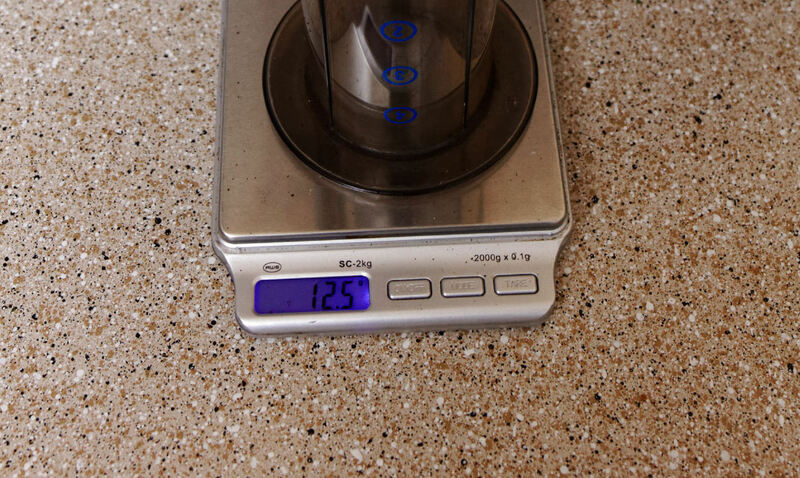 Every bag of coffee is going to offer different volumes or will be slower through your grinder so the only way to consistently brew your coffee is by using a scale. This is not what is prescribed by Aeropress or other sources but I really like 10 grams at the “3 line” and 12 grams at the “4 line”. That’s my story and I’m sticking to it. I’m not super super particular about this. Within a gram and I’m happy. 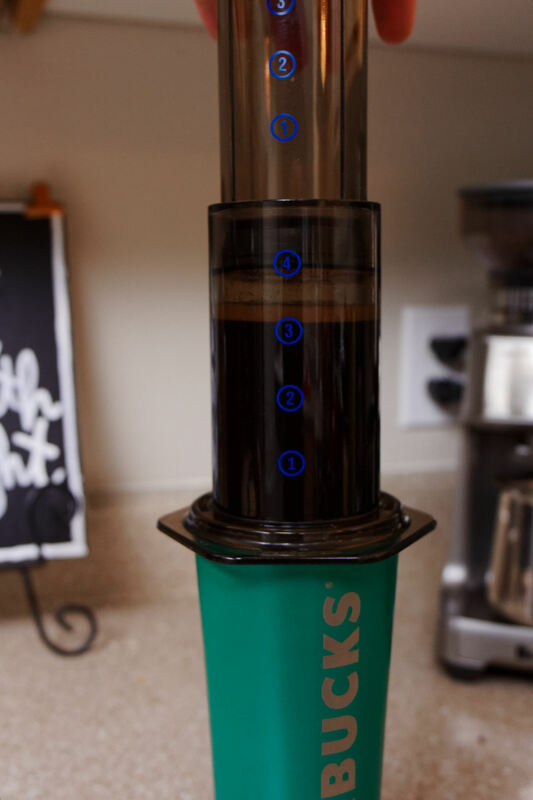 I do what I’ve heard called “the inverted Aeropress method” where you have the plunger side of the press on the counter (numbers upside-down). I feel like it’s simpler and doesn’t taste any worse (yup, tried both, like this method better). I pour about half-way up the Aeropress and then I stir (or swirl) in order to wet all the grounds. Then I pour up to the top (or gosh-darn-close). Too close and you’ll spill everywhere, though. I’ll also quickly rinse off the filter. This isn’t to “get rid of the paper taste” that some say you get from the filters. I personally can’t taste it. I do this to keep the filter attached to the cap. Pure ergonomics. This is yet another example of my rebel lifestyle. I hardly let the Aeropress sit more than a minute, or just enough time to warm up my mug or thermos. I finish filling the Aeropress and then I pour hot water into my mug if I’m staying home or travel mug if I’m commuting to the office. I typically will count to 10 and then dump the water out of my mug and then press the Aeropress in. Simple, fast, done. The cleanup for the Aeropress is amazing. 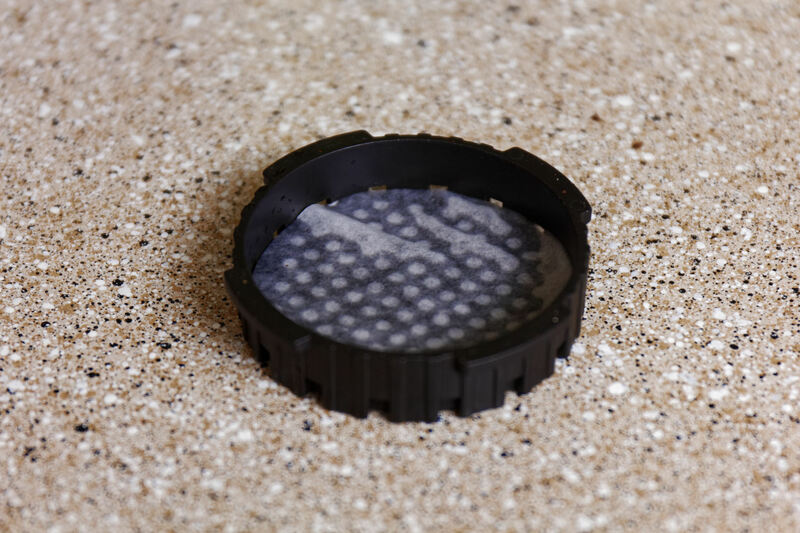 You take off the filter cap, “pop” the puck into your rubbish, and after a quick rinse, you’re done. There you go. That’s how I do it. I hope this helps you out. …and if you were sent here by me if you asked me how I brew my coffee I assure you that it wasn’t a passive aggressive link-share. *Yup, links in this post give a kickback from Amazon. Buy away!